Good-quality reproductive health care requires a continuous supply of contraceptives and other commodities. Family planning providers are the most important link in the contraceptive supply chain that moves commodities from the manufacturer to the client. Accurate and timely reports and orders from providers help supply chain managers determine what products are needed, how much to buy, and where to distribute them. Clinic staff members do their part when they properly manage contraceptive inventory, accurately record and report what is provided to clients, and promptly order new supplies. In some facilities one staff member is assigned all the logistics duties. In other facilities different staff members may help with logistics as needed. Clinic staff members need to be familiar with, and work within, whatever systems are in place to make certain that they have the supplies they need. 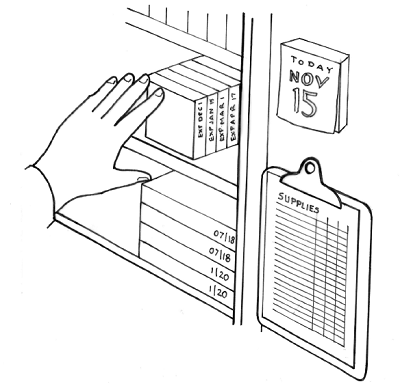 Track the number and types of contraceptives dispensed to clients using the appropriate recording form (typically called a “daily activity register”). Maintain proper storage conditions for all supplies: clean, dry storage, away from direct sun and protected from extreme heat. Provide contraceptives to clients by “First Expiry, First Out” management of the stock of supplies. “First Expiry, First Out,” or FEFO, sees to it that products with the earliest labeled expiry dates are the first products issued or dispensed. FEFO clears out older stock first to prevent waste due to expiry. Count the amount of each method on hand in the clinic and determine the quantity of contraceptives to order (often done with a clinic pharmacist). This is a good time to inspect the supplies, looking for such problems as products past their expiry date, damaged containers and packages, IUD or implant packaging that has come open, or discoloration of condoms. Work with any community-based distribution agents supervised by clinic staff, reviewing their consumption records and helping them complete their order forms. Issue contraceptive supplies to community-based agents based on their orders. A record of the date of expiry of these supplies can help with retrieving supplies that have not been distributed and are out of date. Report to and make requests of the family planning program coordinator or health supplies officer (typically at the district level), using the appropriate reporting and ordering form or forms. The quantity that is ordered is the amount that will bring the stock up to the level that will meet expected need until the next order is received. Receive the ordered contraceptive supplies from the clinic pharmacist or other appropriate person in the supply chain. Receipts should be checked against what was ordered.